Puerto Rico has become a major shipping point for drugs headed to the United States. A recent cocaine bust by the Puerto Rican police and United States law enforcement is a huge win in the continuing fight against illegal drug trafficking. Puerto Rico is a small island in the Caribbean to the east of Cuba. In recent years, Puerto Rico has been used as a shipping point for illegal drugs such as cocaine, heroin and marijuana, to name just a few. 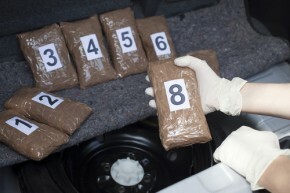 Drug related crimes in Puerto Rico are one of the number one reasons for crime on the island. Violent property crimes have increased in an effort for drug dealers to keep their illegal business going. Drug crimes having to do with territory have also been a problem. Cocaine is brought into the country through secretive means. Cocaine shipments coming from South America will be dropped into the ocean by passing ships or planes, and Puerto Rican drug movers will then collect the shipment and move it on to the next location. Many drug busts have been done by authorities who make it to these floating shipments first. The United States has been teaming up with the Puerto Rican officials to get this illegal drug trafficking under control, as millions of dollars worth of drugs are making it through undetected every year. Drug use in Puerto Rico itself is also a growing concern. In the San Juan metropolitan area, for example, a study was done of eight hundred and forty-nine people. The study found that more than thirty-five percent of these people were using cocaine. This is a much higher percentage than the population using the drug in the United States. Recently the Puerto Rican Police, with the help of United States law enforcement, have seized six hundred kilograms (1,322 pounds) of cocaine in the city of Caguas. This shipment of cocaine was a part of a normal shipping route in Caguas and it is likely that the shipment of cocaine was headed for the United States. The confiscation of six hundred kilograms is estimated to have a street value of over fourteen million US dollars. The cocaine was found in bundles in the back of a van. The driver of the van fled the scene on foot and as of now, no arrests have been made in regards to the driver of the van or accomplices to the drug shipment. It has been found that addicts who have come clean in rehabilitation centers admit that if they had had all the information about the drug and the dangers of addiction, they would have never touched the drug in the first place. Unfortunately, in many areas, including the United States, drug education is not readily available for all citizens at an age where it will be effective. If the facts of drug use and the dangers of addiction are made known, the use of many drugs would likely cease to exist. Drug cartels work to keep education like this away from their clients because cartels depend on addicts for their income. Cartels depend on people who are willing to try harmful drugs and then become regular customers. If society was more educated in the area of drugs, cartels would lose their power to sway individuals into using drugs. Crimes related to drugs in the United States and around the world are some of the most horrific violations of human rights. By raising awareness about drugs, the world will be a much saner place.